Companies taking part in our shows also utilize our websites to obtain pre-show information including exhibitor kits. In addition, our blog HomeandGardenBlog.com and Home and Garden Events Facebook community of 54k enthusiasts across North America now allow us to reach our audience year-round. These facts translate into a lot of qualified eyeballs – over 1.7 million eyeballs to be exact. Any exhibitor taking part in a Marketplace Events produced home show is welcome to advertise their products and services to our targeted audience of potential buyers. 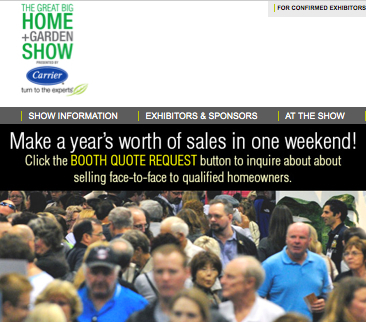 The home show websites can promote your show specials and drive visitors to your booth or website. Email Blasts – Provide an image or text advertisement which can be included in a pre or post show email campaign. Our subscription lists are permission based and targeted by region with over 540k subscribers across all of North America. Lead Generation – Want to run a contest but are unable to host it? We will happily host your contest on our website and collect entries and subscribers for your company. Ticket Sponsor Package – Offer a ticket discount to our customers and have your logo included on our ticketing site, ticket confirmation, websites, and in all advertising. Includes lead generation and data collection. 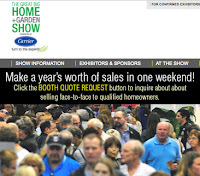 Sponsored Blog Post or Series – We are happy to run exhibitor spotlights on HomeandGardenBlog.com. Exhibitors can answer a few questions about their service or product and we will cross promote each post on all social media channels. Remember, we only want to bring useful and interesting content to our readers. Gift Guides – On special holidays we like to run gift guides on our Facebook page which promote new and unique products that are perfect for gift giving… if you have a product that is perfect for Father’s Day, Mother’s Day, Valentine’s Day, or Christmas let us know. Show Coupons – We’d love to create a page of show coupons for consumers to use at the event. If you have a show special – or want to extend your show special after the show closes – and are considering creating a coupon that is redeemable in your booth or in your store, the home show website is the perfect place to promote it. If you have any questions about any of our digital marketing opportunities feel free to reach out to your sales consultant. Hi, you make mind blowing ideas and a spectacular article here. Last time, when I saw your site this was a little good but today I visit the web site again and find that you guys making a very smart work about outdoor advertising on the site.